With a little less than four months to go, the online mobilisation team at Greenpeace USA joined forces with the traditional grassroots campaigners to leverage a new kind of campaign — one in which the digital and grassroots campaigners would collaborate from start to finish. 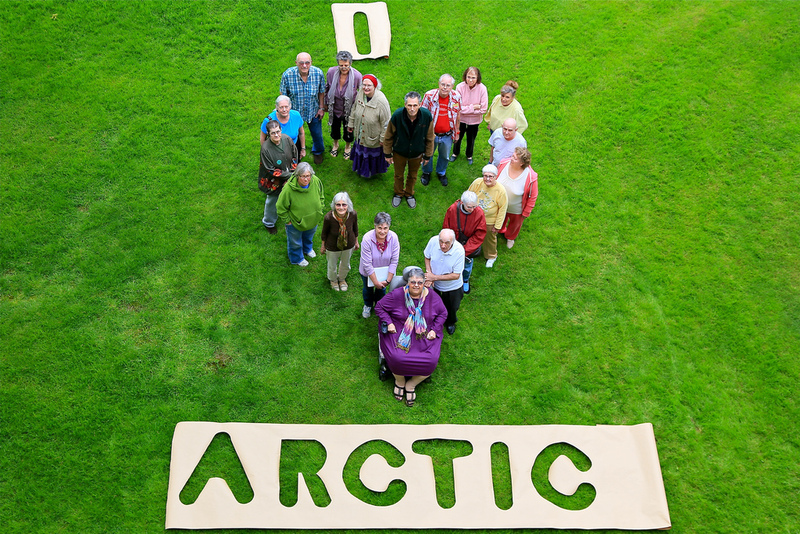 I Love Arctic was the biggest global mobilisation plan for Greenpeace, with 20 offices representing 30 countries co-creating events with their volunteer networks to host massive on-the-ground protests April 20, 2013. The digital-grassroots campaign extended into the day of the event, when supporters uploaded photos live to Twitter and Instagram. The idea was that the momentum created by the posts would strengthen the message Greenpeace was sending to the governing body for the Arctic, the Arctic Council. Merging digital engagement strategies with the offline mobilisation efforts proved to be an exciting frontier, say both the online manager, Cassady Sharp, and the offline strategist, Mary Nicol. Focused around the single day of action, the newly formed team worked to engage volunteers in either hosting an event or attending one. The goal was to mobilise effort around creating a global sanctuary in the Arctic, free from any form of extraction. An audacious goal, to be sure, given the “powerful minds” that would need to be changed and the challenge of accessing the Arctic Council and its various state departments. “We targeted a lot of players,” Mary says, pointing to a wide range, from oil companies to the U.S. Secretary of State John Kerry. “The main thing is we focused on not being able to do it on our own through grassroots engagement,” says Mary. Admitting that Greenpeace’s offline engagement was particularly successful with one-on-one communications, Mary says this campaign clearly called for a “global mobilisation” that would leverage the support of volunteers more actively engaged in online activities. Enter the digital team, who had organized itself into an online advocacy team for blogs, websites, social media, e-mail delivery and petitions, but had little engagement with the grassroots campaign management. Before the first brainstorming session, the strategists held a competition on the popular blogging platform Tumblr. They invited 12 staff to post pieces of campaigns that have been most inspiring. Then the team used that momentum to think collaboratively around the global day of action for the Arctic. Before this collaboration, a traditional grassroots campaign focussed efforts on volunteers known to Greenpeace; the digital team also had a list of known volunteers, although communication systems to each group were different. Marrying the two was the ultimate goal of the U.S. team going into this campaign. “We knew that when people would come to our website and say they wanted to volunteer, they’d fill out the information and receive an e-mail auto response. Then they’d get a downloadable toolkit when a campaign came up, and that was it. We often never heard back from them,” Mary says. For this campaign, the digital team chose a different tactic, one that was visually appealing with the use of two buttons, and offered an option. Once they hooked a volunteer into a host stream, grassroots campaign organizers layered in the specialties that they are best at — phone calls each week to committed volunteers, group conference calls with campaign leaders, chats with other campaigners, for example. Mary says there was a lot of learning in the collaboration. The on- and offline teams shared documents, understanding, time lines, work packages and responsibilities. The challenge, and something the team hopes to better next time ‘round, was ensuring clear communication between all the strategists from the get-go, she adds, mentioning that having the right people in the room for all strategy conversations proved to be crucial. From the standpoint of the digital players, the campaign goal to mobilise 200 events across the U.S. was equally intimidating. They’d had fortunate results from e-mail campaigns dedicated to direct interested volunteers to a sign-up page or online petition, but engaging people in an on-the-ground day of action was something new, Cassady says. Also new: a mixed-message tactic, where the call to action is two-pronged, offering choice to potential volunteers, in this case, either host and event, or attend one. In the end, while there were more than 60 events on U.S. soil April 20, and while the mobilisation effort fell short of the highest hopes, both Mary and Cassady agree it provided valuable learning for the future. “I felt like we learned that we should have been focused more on getting people out to something, rather than asking them to either attend or host an event,” Cassady says. Digitally, the campaign ran with a website starting March 5. The home page linked to the “ask” which offered the two options. The main campaign page was viewed nearly 43,000 times and an average time spent on the page was six minutes, four minutes longer than the site-wide average. The page included a live Twitter feed around the hash-tag #ILoveArctic, with an auto generated tweet sent to John Kerry. On the other hand, the “Find an Event” page was visited roughly 6,000 times and, “surprisingly enough, a big chunk of that came from organic search traffic,” Cassady says. Organic search traffic might include anyone searching for a volunteer opportunity with Greenpeace, for example. “It was interesting for this campaign people spent longer on the home page, poking around at information and possibly enjoying the live Twitter feed,” she says. On- and offline collaboration was particularly effective on the day of action, when the live posts to Instagram and Twitter proved to engage teams in a wide variety of locations. Even during the event itself, as organizers watched the live blogging, they remarked on the number of new people that seemed to be involved. One of the people they hadn’t met yet was Linda Zenicanin in Portland, Oregon. She didn’t fit the stereotype for a Greenpeace volunteer; she isn’t young and she has a physical disability. In the end, the teams grew a new understanding of one another’s strengths, reasoning and strategy, Cassady says. Building on the strength of the communication between the grassroots and online teams from the I Love Arctic campaign, Greenpeace plans more mobilisation this summer using similar collaboration. Cassady says she’s looking forward to more communication with her grassroots colleagues, particularly in explaining what dedicated grassroots volunteers think of as the most “cool” tactics. “We can certainly learn from the more qualitative data that grassroots get,” she says. Following the day of action, the team collaborated on a photographic display which they presented to Kerry’s office. The presentation was made by a group of volunteers clad in polyester cheer-leading outfits, and the series of events leading up to, and during the presentation were tweeted visually to engage the online audience. Across the globe on April 20 more than 17,000 people in 280 cities spanning 38 countries came together to speak out on behalf of the Arctic. They made human banners in the shape of hearts to spell “I Love Arctic”. Photos of the events were presented to the Arctic Council May 15 in Kiruna, Sweden. Do you have an innovation in mobilisation and people-powered campaigns? Share it with Mob Lab by contacting moblab@greenpeace.org.